Motherwell interim gaffer Stephen Robinson has blasted referee Bobby Madden’s decision to award Kilmarnock a penalty on Saturday. Madden pointed to the spot on 90 minutes after an innocuous challenge by Elliott Frear on Callum Roberts. 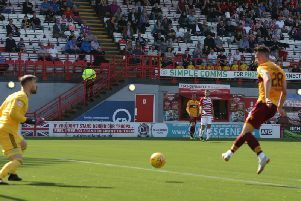 But Kris Boyd’s effort hit the right post and Motherwell held on to claim a vital 2-1 victory at Rugby Park which moved them out of the Scottish Premiership relegation zone. “It was definitely a nailbiter,” Robinson said. “I think it was a result we deserved in the end. “I’ve seen the penalty back again. It wasn’t a penalty. “It’s a tough decision for Bobby. It’s going so fast. Robinson made a bold move by substituting veterans Stevie Hammell and Keith Lasley at half-time and replacing them with Frear and Ryan Bowman. He added: “We put a little bit more positivity into the team. “With Elliott you get a lot of forward thinking and I thought Ryan Bowman was excellent when he came on, was a real handful and a real problem. “We were just more positive. They’ve bought into what we were trying to do all week. “And it showed that they were able to implement what we tried to come and do today. “But more to the point they have shown the fans today that they really care. Robinson said it was good news to get out of the bottom two. “It’s one win,” he said. “If they do that every week then there’s no danger going down. But they need to do the basics right every single week, every day in training. “It’s been a tough week. Mark (McGhee) has been a very good friend to me, guided me immensely in the game as well. “The players looked solid today. “They didn’t look like they were going to concede goals.